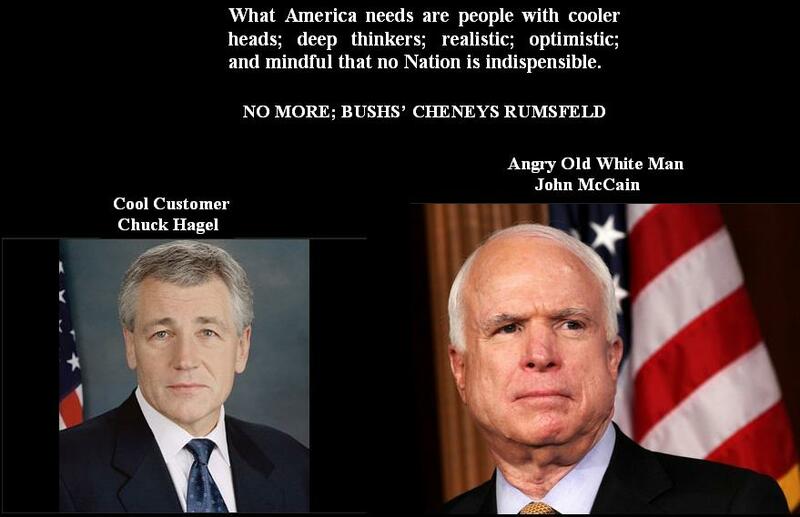 Chuck Hagel – Senate confirmation Hearing for Secretary of Defense, and John McCain! Prior to Senator Chuck Hagel’s unofficial endorsement of Obama in 2007/2008, John McCain and Chuck Hagel were best of friends. Senator John McCain – “The War Hero” that became insane and vengeful after losing the election to Obama in 2008. With each passing day, Senators John McCain is becoming less and less relevant and combined with his self evident vehement hate for President Obama; he is doing much damage to America, his family and his friends. John McCain and Chuck Hagel are both decorated Vietnam War Veterans and used to be “bosom buddies,” that is, until Chuck Hagel unofficially endorsed Obama in 2007/2008 and Mr. Hagel’s Nomination to be the next Defense Secretary. A close study of Mr. McCain prior to his defeat in the 2008 election represented a man who cared about his country; its people and a person who was able to work with the opposition. However, it is self evident that McCain’s loss has sent him bonkers. In 2007, John McCain, Ted Kennedy and former President, George W. Bush came together with sincerity to resolve America’s Immigration problems through Immigration Reform. Subsequent to Obama becoming President, Mc Cain abandoned his position on the Immigration Reform. John McCain is no longer the man he used to be and his insanity has brought out very obvious and sinister peculiarities about the man, and truly, this is a very sad state of affair. But then again that is what “hate” does to people. Chuck Hagel is a good and decent man; a man who when called upon served his country and received; Two Purple Hearts; The Vietnamese Cross of Gallantry; Army Commendation Medal and the Combat Infantryman Badge. Mr. Hagel took the patriotic path as opposed to those that willfully dogged the draft; George W. Bush, Bill Clinton; Donald Rumsfeld; John Bolton; Mitt Romney and so many others. After returning to civilian life Mr. Hagel Co-Founded Vanguard Cellular; served as President of the McCarthy Group and served in the United States Senate from 1997 until he retired in 2008. He is currently a professor at the Edmund W. Walsh School of Foreign Service at Georgetown University. After eleven years of war; thousands of our precious men and women in uniform lost their lives; tens of thousands lost their arms or legs or both and in excess of 60,000 in a peculiar mental state of mind, trillions of dollars spent, we need people like Mr. Hagel who ask us to be clear-eyed and clearheaded. It is my distinct opinion that despite all of the “hubris” from McCain and others to deny Mr. Hagel to be the next Defense Secretary, we do have sixty seven sensible Senators that would see the wisdom in President Obama’s Nomination of Mr. Hagel.